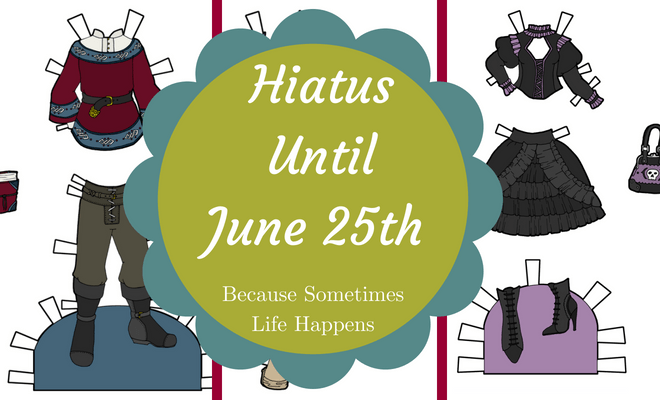 I am putting the blog on hiatus for this week. I just had too much to do last week and this week. So, I’ll return next week. Thank you for understanding while I deal with some personal stuff. At the end of 2017, I decided to retire every paper doll series I’d had and work on developing a new series. My original plan was to make that series one doll, lots of clothing. In the end, I chickened out and made three poses. So, Dames and Dandies wasn’t one doll with lots of clothing. It was three doll series all of which were to scale and stylistically connected. The New Paper Doll Series: Jewels & Gemstones doll on the left and some sketchbook pages on the right. So, as 2018 came to a close, I started thinking seriously about two things: What I wanted in 2019, why I hadn’t gone with my first instinct in 2018 anyway and how important a curvier paper doll was to me as an artist and to people I knew. From those thoughts, the new paper doll series was born. It is one doll pose. Each doll will be named after a different gemstone/rock. A big thank you to my Patrons for helping me pick a name for the series. Sketchbook pages, penciling and Opal in Photoshop. My goal for the next three months (that is until March for anyone whose counting) is to post five days a week. Every Monday through Thursday there will be a new paper doll outfit or doll posted here on the blog. On Friday, there will be an exclusive doll or outfit for my Patreon backers at the 2 dollar and up level. You can join Patreon here. On the blog on Fridays, I’ll be sharing a round up from my own archives around a theme or from a series that never got such a thing. So, for example, I might gather up all the punk paper dolls or fairy paper dolls or redheads or something. I have over a thousand posts on this blog devoted to different paper dolls. I know my archives pretty well and I want to share them with you. If you have any questions, thought, or whatever, please feel free to ask me in a comment or on any of my social media- Facebook, Instagram, or Twitter. Treating Myself to a Holiday Haitus! See You Next Week! Get a real professionally designed theme. The site looks SO MUCH better and the code is so much cleaner. And if I have issues, there’s a professional company I can ask. Upgrade my server subscription and improve site performance. Actually consider hiring a programmer to help make the site SSL secure (still researching this process, but it’s a bit beyond my skill set). Run daily backups of the site. I haven’t needed these yet, but so much peace of mind. I hope, by the way, I never need them. Back in 2016, I had a hack rerouting some of my URLs. This was far beyond my ability to fix, but thanks to my Patrons I was able to get it fixed, which cost several hundred dollars, and have that company install and monitor a firewall. That way it won’t happen again and if it does, they are available to help. Use social media organizing soft wear to try to find new readers and make my art accessible on other platforms like Facebook, Pinterest and Instagram. I work full time. I can’t be manually posting to social media. I’m no “Social Media Guru” but I do know that there are people out there who might love my paper dolls and they maybe on something like Instagram far more than they are on the regular interwebs. I realize that not everyone can donate and I believe in the importance of my art being free. I function on the NPR model and the hope that if you have a few bucks and you love the blog that you might step up and help cover the expenses. It’s not required, but it is gratefully accepted. All right, I thought I would clear the end of the fiscal year without too much trouble, but travel and work has reared it’s head, so I am pausing things here to build up a strong buffer of content to coast (I hope) though the rest of the year. There will be updates on my Patreon page while I work on this. Some public, some Patrons only. As always, thank you so much for all your support.